Describe the seismic-design strategies and systems deployed in the three projects profiled. Resilience is the ability to bounce back after a disturbance or interruption, or the capacity to withstand, recover from, or adapt to stress, misfortune, or change. By now, design teams are at least accustomed to considering this concept and a building’s response to such hazards as flooding, intense wind, and drought. You might assume that for one threat in particular—earthquakes—modern codes assure resilience, essentially guaranteeing that ­recently built structures can be quickly reoccupied, or at least readily repaired. It sounds totally reasonable—right? But that is not the case. Codes were devised to protect lives, not property, so they do little to limit the kind of destruction that might make a building uninhabitable for an extended period of time or even necessitate demolition. In fact, recent studies often quoted in engineering circles estimate that code-compliant buildings could suffer two years of downtime after a significant quake. “By design, codes focus only on safety, and therefore tolerate lots of damage,” says David Mar, partner at Berkeley, California-based Mar Structural Design. The new central library (top) in Christchurch, New Zealand, is one of several anchor projects in the redevelopment of the city’s downtown (bottom right) following a string of earthquakes in 2010 and 2011. Much of its five-story rectangular volume is surrounded by a perforated golden veil, omitted in places to reveal terraces and allow views to the surrounding landscape. This focus on enhanced performance is a global trend. Seismic resilience might not be necessary for all buildings, but it is certainly relevant for those that represent a significant investment, house critical business activities, provide essential services, or are important community or cultural assets. 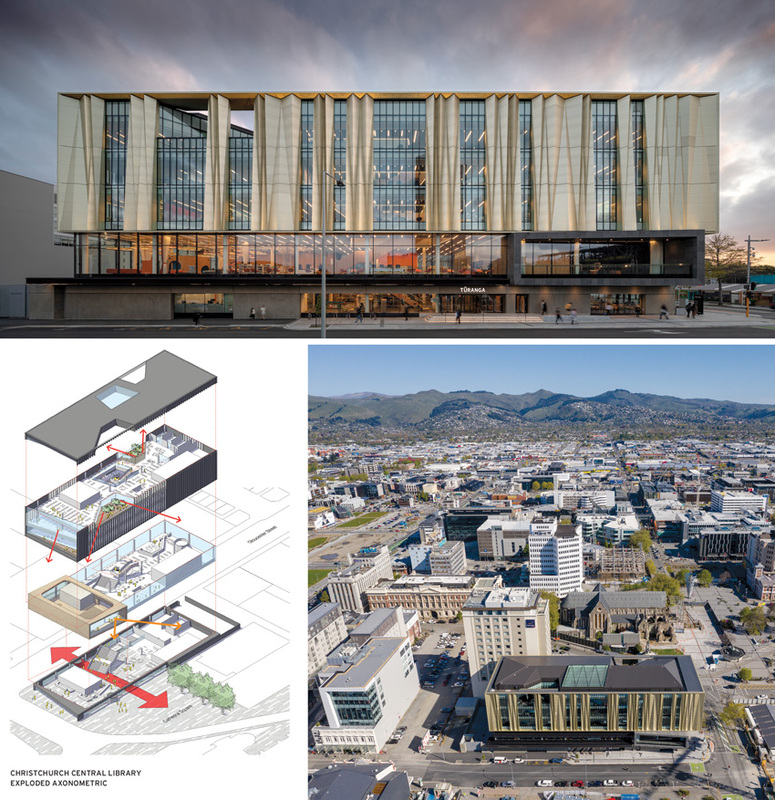 One such recent project is Turanga, the new central library in Christchurch, New Zealand, which opened last year and included stringent structural and seismic criteria as part of its bidding requirements. Its performance goals are not surprising: the $63 million, 106,000-square-foot library, designed by the New Zealand-based firm Architectus with Danish architects Schmidt Hammer Lassen, is considered one of several anchor projects vital to the redevelopment of Christchurch after a series of major temblors hit the region in 2010 and 2011. Ultimately, 70 percent of the city’s downtown was demolished due to extensive damage, though very few buildings had actually ­collapsed. Local engineering firm Lewis Bradford Consulting Engineers developed what they term a “low-damage” seismic solution for Turanga. In addition to safeguarding the occupants, the strategy is intended to protect the structure, the fabric of the building, and its contents. A folded, perforated metal veil surrounds much of the library’s five-story rectangular volume, but is selectively omitted in some sections to reveal terraces and allow views to the surrounding landscape. Under­neath this skin, at the building’s perimeter, is a largely conventional steel moment-resisting frame providing approximately 30 percent of the structure’s earthquake-load resistance. Most of the seismic work, however, will be done by three “rocking wall” cores that allow the building to sway and then return to its original position. 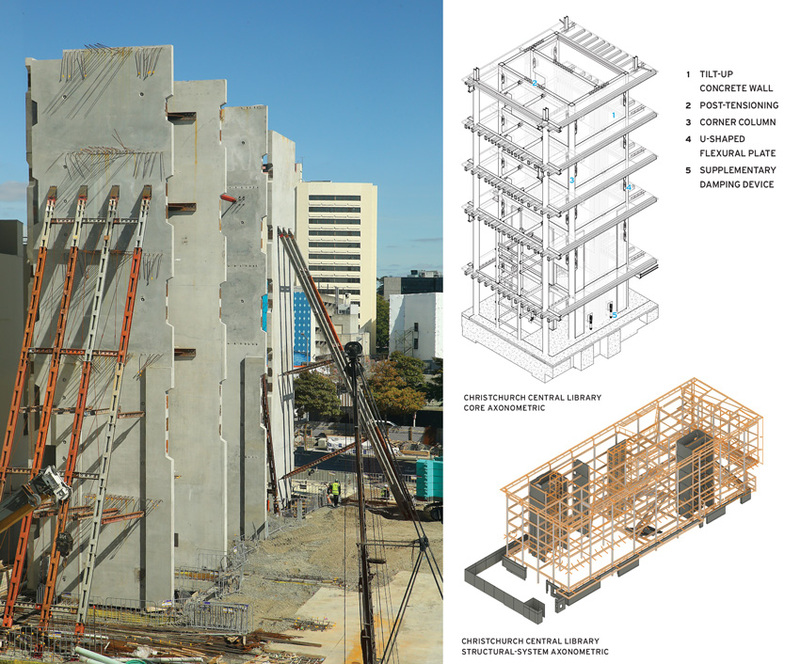 The Christchurch library’s structural system comprises a largely conventional steel moment frame and three “rocking wall” cores (right). The cores (top, right), which recenter the building after a quake, include 82-foot-tall post-tensioned, site-cast concrete walls (left).